God has called me to start this ministry, to encourage you in your faith, and to provide free Bible training, so that you can go forth and do the will of God in accordance with what He has purposed for your life! Regardless of your job, your status in life, where you live, your denomination, or your gender, you are called by God, as His child, to know Him and make Him known, and to live as kings and priests in this earth, bringing His victorious, mountain-moving Kingdom of glory into our fallen world. If we all did that, what a different world we would live in! I pray that these courses will deepen your faith and dependence on Him, and inspire you to be a mighty vessel in the Master's hand, in Jesus' name! If you'd like to connect with me, you can find faith-building tools at In His Hands International Ministries, or connect with the ministry of my heart at Hope's House Kenya. Please connect with me via email at inhishandsbiblecollege@gmail.com, check out my testimony and books at In His Hands International Ministries, and join with the work of my heart at Hope's House Kenya. It is a blessing to be a co-laborer with you in the house of the Lord! To complete this course and receive your certificate, read through this page, then scroll to the bottom, complete the Course Contents and their requirements, then email a 1-page testimony, explaining your relationship with God through Jesus Christ; and a 2-page essay letting us know what you learned in this course and how you plan to apply it in your life and ministry, with Scripture references to inhishandsbiblecollege@gmail.com. You can access these free classes in other translations from these links and directly from their website. Harvestime International Network is a non-denominational Christian organization committed to recruiting, training, motivating, and mobilizing a network of international harvesters capable of intercession for spiritual harvest, articulation and demonstration of the principles of spiritual harvest, and mobilization of laborers to reap the worldwide, end-time harvest. This curriculum is completely free and self-paced. It teaches you to hear God's voice, walk in greater levels of faith, understand key spiritual principles, and to live a life of passion, purpose, and victorious service in Christ to further His Kingdom and to be a part of the spiritual harvest in this earth. 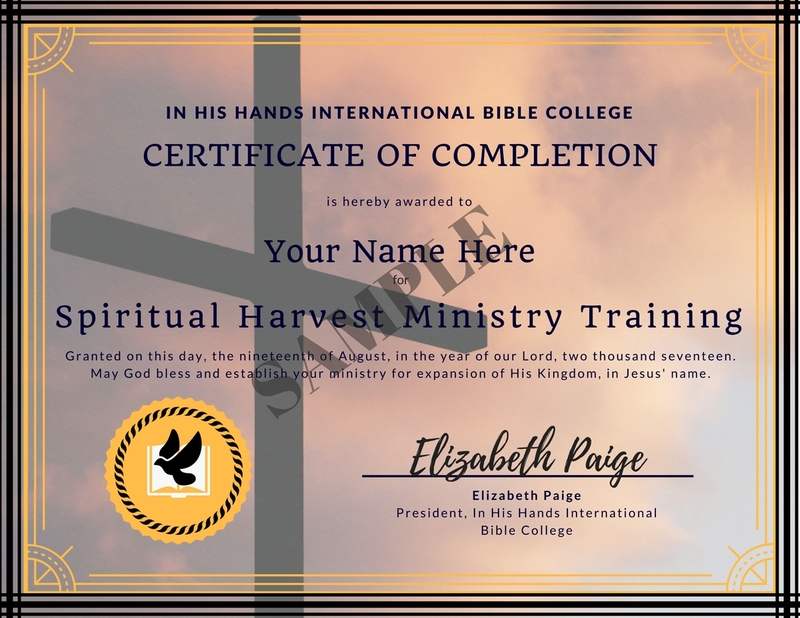 *This course is 100% free, however, if you would like to receive a Certificate of Completion from In His Hands International Bible College, we ask that you send a donation of any size to support Hope's House Kenya and Hope and Light Academy, our orphanage and school in Kitale, Kenya (students from third world nations or anyone in financial need does not need to donate, but we appreciate your prayers, which are worth far more than gold), as well as e-mail a 2-page essay explaining what you learned with at least 3 Bible references to inhishandsbiblecollege@gmail.com (with the subject "Harvestime"). Thank you for growing in God's Word with us! We are praying for God to do mighty things in and through you, in Jesus' name!